Well, I finally finished my Advent Calender. I had so much fun putting this together. I highly recommend this as a project. One of the best parts was finding all the little goodies to put on it. Once I had everything, it went together pretty quickly. Without further ado, here it is. Wow, this isn't a very good picture. I think if you click on it, you will be able to see the detail much better. It looks way better in person. For this project I used an old screen I found at an antique sale last year. I wasn't sure what I would use it for, but it was cute and cheap and I thought maybe it would make a good display piece. The garland around the frame was from One Hundred Wishes. I think it is just perfect as it is kind of tarnished looking and vintagey. The tags I used are the ones I tea dyed awhile back. 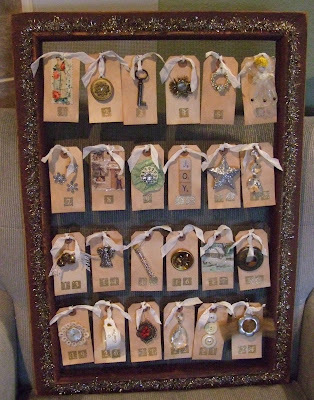 Thanks so much to Joy for sharing some of her trinkets and ideas on this project. We had so much fun stamping and embossing the numbers on the tags. I wanted to show you some more pictures of Randy's shop, Madison Park. Isabel and I went to his grand opening last week. He has amazing taste. Of course I didn't take pictures of my favorite things he had for sale, antique doll beds. I guess I will have to go back. 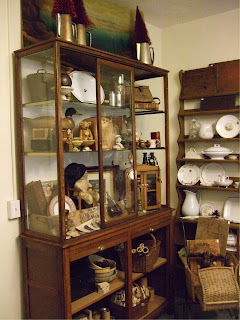 Love the little cabinet in the big cabinet pictured here on the left. 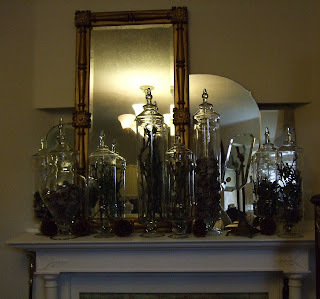 I love this mantle display with the jars of twigs and stuff. How cool is that. Of course I love the mirrors too. This picture is kind of dark, but if you click on it, you get a better detailed view. 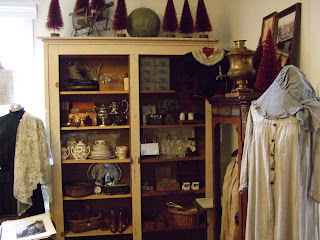 Here is another corner of the shop. Lots of cool cabinets hold lots of interesting little bits and pieces. He also sells a lot of antique clothing items too. Isabel and I were very good and didn't buy much at Randy's. She got a cute pink corset for her collection and I bought two vintage doll outfits. Here are a couple pictures of scary bear from the flea market modeling them. I think they are a little tight. 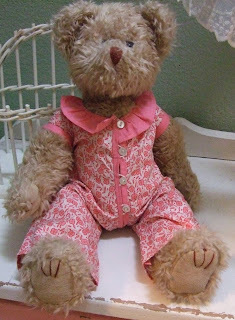 Scary bear had to hold her breath while I did the buttons, but I think she likes her new outfits. 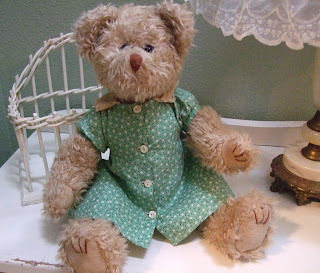 I especially like the aged lace collar on the green dress. Before I go, I just wanted to show you the goodies I got at Joy's the other day. I just love the vintage style ornaments. 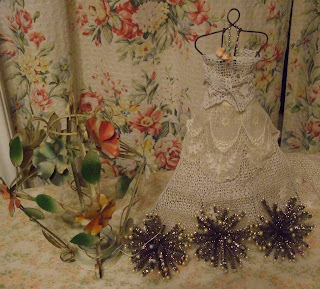 The little wire manequin was naked and I just threw on some lace, a little pearl chain and some vintage flowers. Not a permanent outfit, but I couldn't just photograph her naked now could I. I'm going to have fun playing with this new toy. The tole candle holder is kind of camoflaged with the floral drapes in the background, but it is so cute and I just love it. Right now it is hanging on a hook under my sewing room cabinet. I need to find a little candle to put in there. Well, I hope you enjoyed my pics. today. Got lots more projects in the works and in my head, better get busy. Have a fabulous weekend! I LOVE your Advent calender! What a great idea. 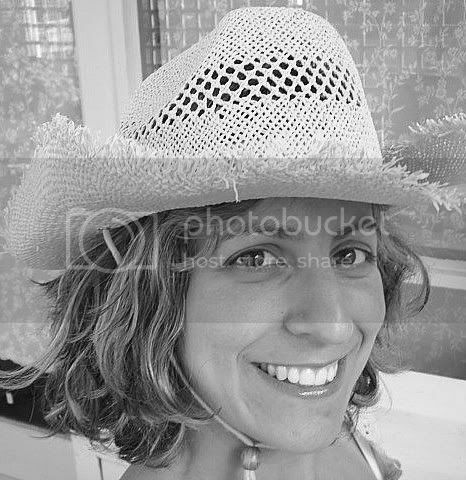 So sweet and vintagey looking! Where's mine? I love the Advent Calander. It's so very Catholic, lol...I have the same Advent Calandar I've had most of my life...it's needing a little repair work, so maybe I'll work on that!!! I love, love, love your advent calender..day17 has the sweetest house and what a cute button snowman on day23...I think the garland is the perfect touch. I love all the trinkets you used for your calender. That is a really cute idea! Again I love your goodies, I would go to town in your shop I swear!!!! I am in love with that calender!!! It really looks wonderful...like an old family heirloom! I wonder if I have enough time to make one by the 1st???!!! I really like your Advent calendar, too! And I'm enjoying the shop pictures. Your friend has done a great job of displaying the merchandise. Your Advent calendar is awesome! I have the same vintage floral candle holder! Mine is in my bathroom and I too just love it, great find! I love your advent calender! What a great idea. 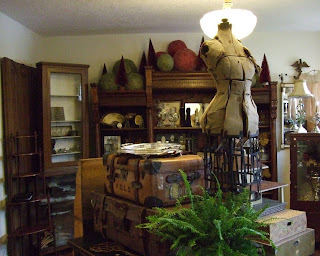 I also am in LOVE with that little wire mannequin...so so sweet!